What happens when an online bot gets arrested by police? There was only so long that the police would let a bot created by Swiss art collective !Mediengruppe Bitnik order all manner of things from the darknet in the name of art. Random Darknet Shopper has been randomly buying nefarious goods since November, with the objects shown at a Zurich exhibition called The Darknet – From Memes to Onionland. An Exploration. With a set budget of $100 per shopping trip, Random Darknet Shopper has ordered a fabulous array of objects from the depths of the web: Diesel jeans, a set of fire brigade master keys and Chesterfield cigarettes. But police finally took exception to its order of 10 ecstasy tablets and a fake Hungarian passport. Last week, the bot was seized by Swiss cops, one day after the exhibition closed. In a statement on the !Mediengruppe Bitnik website, the group hit out at what they perceive as "an unjustified intervention into freedom of art". We caught up with two members of the collective to see if they'll face criminal charges for the actions of their bot. Is Random Darknet Shopper in custody? !Mediengruppe Bitnik: Yes, Random Darknet Shopper and all the objects are in custody. But they are sealed. This means, that the public prosecutor has to hear us before he can proceed with any actions. We think this will happen in the next few days. Are you under threat from the force of the law yourselves? Have the police spoken with you? !Mediengruppe Bitnik: It is unclear if we are. Until now, no charges have been pressed against the bot or against !Mediengruppe Bitnik. We have no direct contact. Only through our lawyer have we been in contact with the public prosecutor. Through her, we have had to claim ownership for the Random Darknet Shopper since we want the seized objects back. Judging from the public statements from the public prosecutors office, it looks like their main interest lies in the destruction of the drugs and not in prosecuting us. They also seem to have a good sense of humour. They've publicly stated that they enjoy being part of the art project, because the piece raises interesting questions in their field. They've even suggested to use the order of forfeiture instead of the MDMA in future exhibitions. That's quite some art expertise. What’s your favourite thing that it purchased? 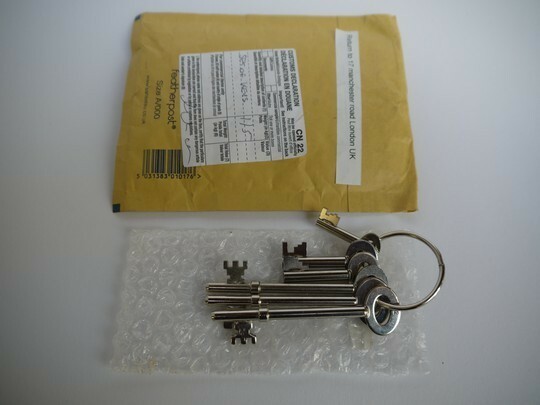 !Mediengruppe Bitnik: It's still the fire brigade masterkey set from the UK. It has this magical potential of opening doors and gates. Which darknet sites was the bot operating on? !Mediengruppe Bitnik: Random Darknet Shopper only operated on Agora, one of the biggest darknet markets at the moment. !Mediengruppe Bitnik: Yes, definitely. We want it back! Not only because there are other institutions interested in exhibiting the work in the near future. The Random Darknet Shopper has also become dear to our hearts. For 12 weeks it thrilled us with the purchase of another obscure item every week. Quite a shopping experience every time! And then after a few days wait each of the items would beautifully materialize from the dark. Would you like to buy some Fairtrade coke?